Madison, WI – October 9, 2017 – GrocerKey, the software and operations leader transforming brick and mortar retailers into digital leaders, today announced its CEO and cofounder, Jeremy Neren, is an invited speaker at a food industry conference sponsored by research house Redburn for its institutional investor clients. The event takes place October 11, 2017, at Claridge’s in London. “I look forward to speaking at this important conference and thank Redburn for inviting me,” said Neren. 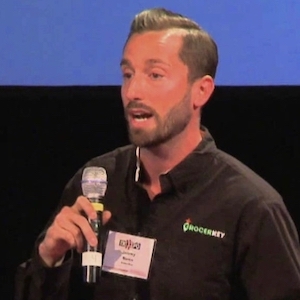 “I’m excited to share the growth story of GrocerKey as we help U.S. grocers adopt an ‘omni-commerce’ strategy to address disruptive changes in the industry.” Other speakers at the event include Craig Herkert, former CEO of SuperValu and previously a senior executive at Walmart. Mr. Neren’s enterprise software and eCommerce grocery operations experience was developed through a decade in the eCommerce grocery industry. GrocerKey’s customers include several major retail chains throughout the U.S. The company goes well beyond advanced digital technology to partner with its customers — specifically with planning, training, and strategy to help ensure the profitability of their eCommerce grocery operations. GrocerKey has several key industry veterans as strategic advisors. Founded in 2014 and based in Madison, Wisconsin, USA, GrocerKey is a fast-growing software company that helps brick and mortar retailers adapt to the new digital and mobile world. The company offers a retailer-branded eCommerce and mobile shopping solution for retailers of all sizes. Offered on a highly scalable software-as-a-service platform, GrocerKey’s solution helps brick and mortar retailers become successful omni-commerce retailers. The GrocerKey solution includes an omni-commerce platform designed to integrate with retailer’s existing merchandising, loyalty, and point-of-sale technologies. It also includes online and mobile shopping, store-based picking, and delivery management capabilities. For more information, please visit http://www.grocerkey.com. Redburn was launched in 2003 on a passionate belief in the importance of in-depth, uncompromised, fundamental research to serve its clients. Headquartered in London, it also has offices in New York, Boston, and San Francisco. Redburn hosts annual industry research conferences that focus on delivering insights and analysis of the topics, trends, and issues in a particular industry. Speakers include private company executives, academics, consultants, government figures, experts, and regulators. Third-party expertise often challenges established views and delivers fresh perspectives for its clients.